My granddaughter and I were in the garden playing in her new sandpit when we heard raucous calls and squawks coming from somewhere up high in a neighbouring ash tree. 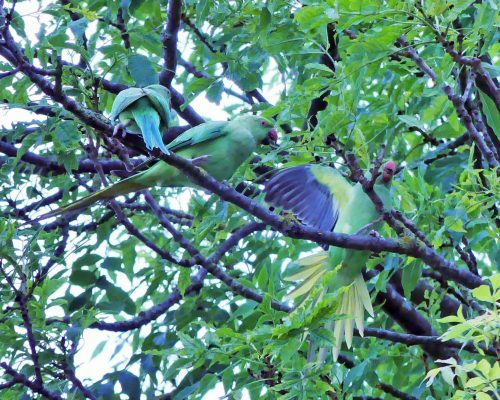 Despite the racket they were making it took a minute to visually locate the perfectly camouflaged trio of bright green parakeets that had landed there. I’m not sure what the commotion was about, but they seemed to be a family, I think an adult female with two young ones demanding food. 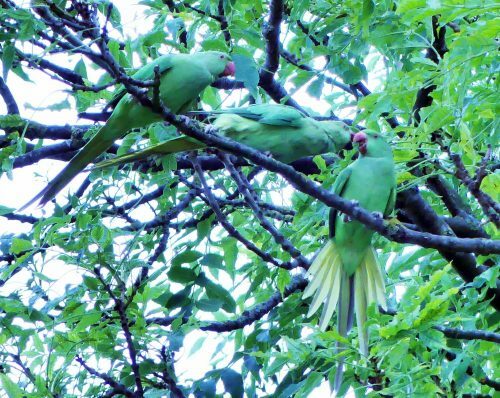 Nowadays, sightings of these ring-necked, or more prettily named rosy-ringed parakeets, are commonplace throughout the county of Surrey, particularly in those leafy suburbs of Greater London lying closest to the river Thames. Tales of how they first arrived and set about colonising the area are as colourful and as exotic as the birds themselves. One tells of a small number of the birds escaping from a film set at Shepperton Studios in 1951, during the making of ‘The African Queen.’ (which starred Humphrey Bogart and Katharine Hepburn, in case you’re way too young to remember that one!). Another, less likely perhaps, but more appealing to me, is that they were released back in the 60’s by the legendary rock guitarist Jimi Hendrix, who allegedly brought them to Britain and released them, ‘ to bring some psychedelic colour to London’s skyline’, (perhaps whilst playing ‘Little Wing’?). Then for our younger viewers, it is rumoured that a pair were released by the Blue Peter cast into the Blue Peter garden as recently as the 1990’s. The truth of their introduction to British wildlife is likely to be far more prosaic and plausible. Parakeets have been popular pets since Victorian times and inevitably many birds will have escaped or even been deliberately released over the years, although the latter is technically illegal. A number of them are known to have escaped from aviaries across the south of England. During the Great Storm of 1987, some made their getaway from Northdown Park, in Kent, and it is rumoured that a piece of a plane’s fuselage dropped onto an aviary near Gatwick, giving more the chance to fly the coop. 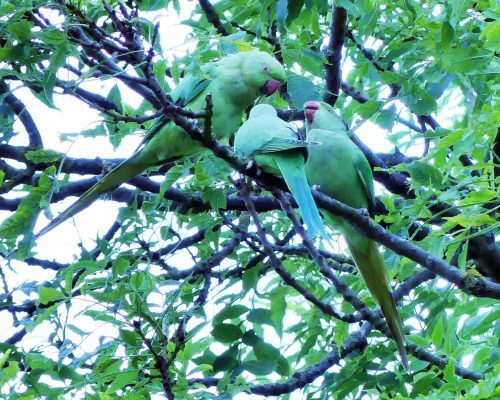 There is no doubt the parakeets are now well established in Britain and are recorded as our only naturalised parrot. In January 2017 the BTO estimate was of 8,600 breeding pairs and their status given as ‘introduced breeder’. The greatest concentration of numbers are in Greater London and Kent, with smaller numbers in Birmingham and Oxford and further north in Manchester. They are especially common in suburban parks, large gardens and orchards, where food supply is more reliable. The birds feed on a wide variety of fruit, berries, nuts, seeds and grain, have discovered bird feeders in gardens and have few natural predators here. 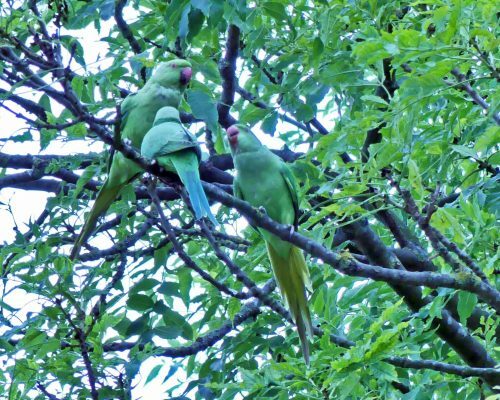 Until recently, the parakeets were generally considered a welcome addition to the county’s wildlife, and though their squawking and squabbling may have caused consternation to some, most people have enjoyed the sight of the colourful birds flying around. However, concerns have arisen about their population explosion and its potentially damaging effects on the country’s indigenous bird species, which has led to calls for stricter control over the colourful newcomers. 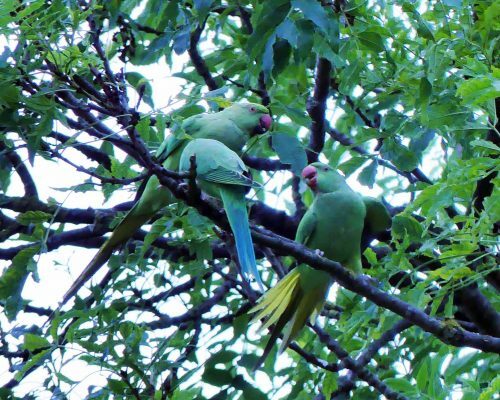 In 2009, Natural England added the species, the UK’s only naturalised parrot – to its “general license”, meaning it can be culled, in certain circumstances – such as if they are causing damage to crops. The change gives them the same legal status as pigeons, crows and magpies. As an occasional visitor to London, I love to see and hear them and they’re big, noisy, colourful and pretty to look at – a great way to get my two year old granddaughter to start noticing the local wildlife!